This entry was posted on August 6, 2014 at 7:14 pm and is filed under Teffi. You can follow any responses to this entry through the RSS 2.0 feed. You can leave a response, or trackback from your own site. Great review, as ever. I have a copy of this collection on my kindle, and I’m keen to get to it fairly soon. It sounds as if the stories vary in tone and subject, and I’m intrigued by the one on Rasputin. Yes, I would recommend it. It’s great to have such a reliable publisher as it encourages you to try new writers. I hope you didn’t think the review was negative as I enjoyed the book and hoped to recommend it to others. As I mentioned, I felt the stories grew in depth as the collection progressed, and the story you single out does make a particular impression. I should have made more of this. However, I felt that the early stories were slight if entertaining, and that the satires were quite simplistic. 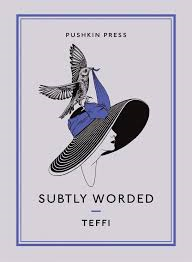 You’re probably correct that I haven’t done Teffi justice but (as the blog’s title suggests) these are my thoughts after a first reading. The point that I was trying to make at the end was that a writer’s work should not have to be an undisputed classic to be rediscovered, and to state how pleased I was that translators such as yourself had made the stories available in English. Thank you very much – and I should have made it clear in my first comment that I thought everything else in your review was clear, perceptive and well expressed.